Throughout Austrian ski villages, you’ll encounter clocks which run backwards, the hands arcing from right to left. Time passes a different way in the Austrian Alps — and snowy space expands to cosmic, crystalline dimensions. From a viewpoint such as 9,216-foot Valluga in St. Anton, the universe seems to hold nothing but mountains … glacial, glinting, glittery, frosted by a Midas touch of silver rather than gold. Long, long cruisers unfurl like the autobahn, and off-piste bowls beckon like gargantuan helpings of Viennese schlag (whipped cream). Cocooned in narrow valleys, 700-year-old villages look ready for a winter remake of The Sound of Music with their half-timbered fronts, onion-dome churches, and delicate murals depicting gamboling deer and coy shepherdesses. The Alps span five nations in Europe. In Austria, they soar above the western part of the country, covering most of the federal states of Tyrol and Vorarlberg. What ancient Athens symbolizes for democracy, the Austrian Alps signify for winter sports — the cradle of skiing civilization. 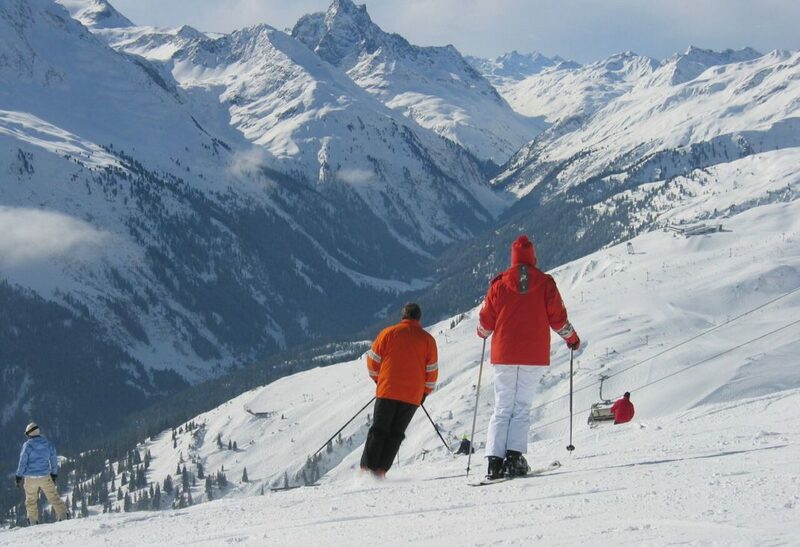 The first ski club in the Alps was founded in the Arlberg in 1901. In the 1930s, Hannes Schneider (from Stuben) brought the Arlberg technique — the foundation of U.S. ski instruction — to America. Austrians helped pioneer several American ski resorts, including Friedl Pfeifer (founder of Aspen) and Sepp Ruschp (who created the Stowe Ski School). Austria won 14 alpine skiing medals at the 2006 Winter Olympics in Torino (the U.S. won two) — amazing for a Mittel-European country with just eight million residents, whose best-known export is Mozart. In Austria, you don’t just ski a resort — you ski an entire region. Take the skiable acreage of Lake Tahoe’s Squaw Valley and Heavenly. Add on another 50% — and then imagine that you could ski everything in between. That approximates the vastness of just the Arlberg region, where skiable terrain covers 20 square miles. Skiers often log 5,000 feet of vertical in a single run. In the small, close-knit Austrian mountain villages, a combination of local traditions and ownership restrictions bans land sales to outsiders — even other Austrians. Condos are not permitted. Instead of Marriotts or Ritz-Carltons, visitors stay in gasthöfe (small, family-run inns). Innkeepers themselves often pick up arrivals at the train station and cook meals in the restaurant. Although small, many of the gasthöfe are grandly appointed with antiques and in-house spas. Alongside Old World charm, the ski villages pack in upper-crust luxuries. Instead of hard-core gear by North Face and Patagonia, boutiques showcase haute-ski couture by Chanel and Prada. On mountain, snow riders are treated to lifts with heated seats. Add in the clear protection domes and the ride up feels more solarium than ski-slope. “In Austria, no one skis hard after lunch,” points out Adi Werner, owner of the Hospiz Alm in St. Christoph. It’s easy to understand why once you settle onto a sunny deck at one of the mountain huts for which the word gemütlichkeit seems invented. Tyrolean specialties include knödel (dumplings that can come in cheese, spinach, or mushroom renditions) and gröstl (potatoes, onions and cured pork cooked in a skillet) — and those can be just appetizers. Main courses include wiener schnitzel (breaded veal) — often the size of the platter it comes on. The food pairs perfectly with Grüner Veltliner, an Austrian white wine that balances flavors of tropical fruit with a peppery edge. One of the best surprises about an Austrian ski vacation: prices are surprisingly affordable. Figuring in airfares, accommodations, meals and lift tickets, it’s often cheaper to ski Austria for a week than paying for a comparable vacation in Colorado. Lift tickets offer an especially good deal: $47 per day at Kitzbühel compared with $81 at Vail last season. The Arlberg region encompasses five towns in western Austria clustered around the 5,883-foot Arlberg Pass, a trade route dating to the 1300s. St. Anton and St. Christoph lie to the east, in the state of Tyrol; and Lech, Zürs and Stuben to the west, in the state of Vorarlberg. Here’s the pretty part — you ski between them on one lift ticket that accesses 86 lifts and 274 miles of runs. 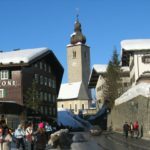 A local joke runs: “You go to Zürs with your girlfriend, to Lech with your family … and to St. Anton with your skis.” Tucked into the Stanzer Valley, St. Anton is the patron saint of off-piste skiers. Storied descents include the vortexes off the backside of Valluga. Not that all the terrain is chutes, cirques and powder plunges. St. Anton offers plenty of cushy cruisers, as impeccably groomed as a waltzer at a Viennese ball. 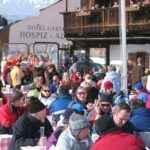 On-slope action is matched by an enthusiastic après-ski scene: the number of bars (82) nearly equals the number of lifts. Try music-throbbing hotspots such as the Mooserwirt or Krazy Kanguruh. With so much powdered playground to explore, how do you find the best untracked ivory in which to etch your tracks —not to mention your way home at the end of the day? 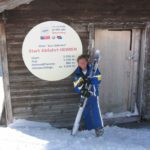 The answer: hire a private guide from the Ski School Arlberg, founded by Hannes Schneider himself (about $400 per day for two people). Part instructor, part best friend, the guides have near-psychic communion with the snow gods, knowing where to find squeaky-fresh stashes or bumptacious mogul fields. 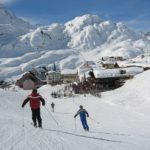 The ski itinerary usually takes in neighboring villages. 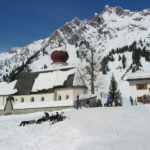 St. Christoph dates to the 14th century, when a shepherd built a shelter for travelers crossing the perilous Arlberg Pass. Set at 5,900 feet — one of highest elevations of any village in the Alps — the hamlet gleams with stucco chalets painted Easter-egg hues of pink, yellow, and peach. During the winter, the 32 inhabitants are joined by visitors swapping crowns for ski caps, including Prince Edward of Great Britain, Princess Caroline of Monaco, and King Juan Carlos of Spain. The place to lunch: the upstairs terrace at Hospiz Alm, centered around the original 14th-century building. Owner Adi Werner houses one of the biggest collections of large-format bottles of Bordeaux outside France. Lunch selections might include roast duck or their special hamburger, which you can pair with a $155 bottle of Château Cheval Blanc from St. Emilion. There’s plenty of off-piste fine dining too. Past meets repast at the Museum Restaurant in St. Anton, set in a former private mansion dating to 1912 that also houses the Ski Museum. The most unusual dish here: Chef Harry Winder’s “straw cappuccino soup,” based on an old Tyrolean recipe. Beef consommé infused with — yes — straw, is topped with a milk foam so that it looks like your morning Starbucks. Ensconced in a wooden chalet, Hotel Monjola reflects the warmth and family tradition of Austria’s gasthöfe (along with having Wi-Fi in the lobby for the Internet-addicted). The inn is run by Peter Nohl, whose parents started taking in lodgers in 1952. Very outgoing and speaking perfect American English (he lived in North Carolina, Pennsylvania and New York for several years), he helps guests with everything from train pick-ups to ski-school reservations. An elegant chef, his wife Rosa Maria creates rich-yet-light renditions of classic dishes such as Zweibelrostbraten (beef smothered in onions). 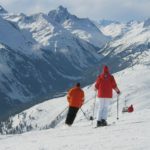 Her chocolate crepes for dessert will leave you promising to ski extra energetically tomorrow (www.montjola.com). In the Arlberg, when you’re talking about the Ring Cycle, you’re not referring to Wagner but Der Weiße Ring — “The White Ring” — which circles from Lech to the neighboring villages of Zürs, Zug, and Oberlech. The quartet lies nine miles from St. Anton, on the northern side of rugged, 5,820-foot Flexen Pass. A mix of novice and intermediate trails, the White Ring nonetheless challenges skiers with occasional narrows and steeps. Although competitors in the annual race complete the circuit in about 44 minutes, the tour generally is an all-day adventure for visitors who stop to take photos from the Rüfikopf summit, or lounge beneath the swaying, faux-palm trees on the Palmen Alpe sundeck. Think of Lech as Beverly Hills — with altitude. Along the main street by the Lech River, the après-ski scene feels part disco, part Downhill Racer. Techno music humpa-humpas from bars such as Pfefferkorn’s, and bronzed alpinists stride the avenue as if it were a designer runway. For fashionistas, Strolz is the ultimate ski boutique, carrying parkas and pants from designers such as Bogner and Dolce & Gabbana. The townlet is known for its preponderance of fine restaurants (including two with Michelin stars) and the elegance of its hotels (practically all ski in/ski out). With its columns and carved panels, the Hotel Schwarzwand combines sophistication and charm. Through large windows, diners in the restaurant can watch snow cats grooming the slopes, the headlights twinkling like stars (www.schwarzwand.com). A great choice for families, Oberlech is entirely car free: a series of tunnels discretely brings services and supplies to its hotels and restaurants. Located just north of Lech, it offers restaurants such as the Burg Hotel, Kriegeralpe, and Rud Alpe, which make favorite places to commemorate completing The White Ring. Princess Diana (who made tabloid headlines) stayed in Lech. The royal families of the Netherlands and Jordan (who don’t) stay in Zürs. Sixty-five percent of its guests book the same room each year. Democracy, however, prevails at Vernissage bar and club in the Skiclub Alpenrose, where partying patrons range from off-duty dishwashers to (rumor has it) Johnny Depp. About 8,500 people live in Kitzbühel. And each January, 60,000 revelers arrive to witness the Hahnenkamm World Cup ski races, regarded as skiing’s answer to the Kentucky Derby, Super Bowl — and maybe throw in Mardi Gras too. American Daron Rahlves, who won the downhill 2003, commented, “It’s the toughest [race], mentally. There’s no way to test yourself for that except skiing it.” Even if you’re not podium caliber, you can swoop down the championship run (known as the “Streif” by locals). Despite the harum-scarum Hahnenkamm, more than 70 percent of Kitzbühel’s 1,700 acres of terrain rates as beginner or intermediate. 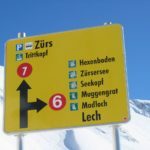 Instead of the skull-and-crossbones names bestowed on trails in America (“Widowmaker” and “Chute That Seldom Slides”), trail monikers here derive from farmers’ fields and folklore, with designations such as Bärenbadkogel (“bear’s bath mountain”) and Kasereck (“cheesemaker-edge” lift). 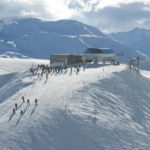 An astounding 42 different mountain inns and alpine huts offer sustenance on the slopes. At the Hahnenkammstüberl, located just above the famous downhill run, owner Lisi Patscheider serves the definitive Kaiserschmarrn — a dense pancake served with applesauce or plum preserves. Apres-ski, visitors change faster than Clark Kent from Gore-Tex and polypropylene into cashmeres and furs to troll boutiques lining the cobblestoned pedestrian streets of town. Der Spiel Fuchs carries captivating children’s toys and stuffed animals, and Nikolaus Fuchs offers gourmet-to-go salamis, pâtés, and cheeses. For drinks, the soigné-set gathers at Jimmy’s, which has a sophisticated, Jazz Age decor. Offering a serene change of pace, Hotel Seebichl is nestled on a scenic lake just 1.5 miles away (www.hotel-seebichl.at). Frequent shuttles whisk guests to town and the lifts. When it’s time to go home, visitors find themselves wishing that those reversed clocks really did turn back time. That way, a ski vacation in Austria’s Alps might go on forever. – Getting Around. Americans will find traveling around Austria easy. English is widely spoken, and the fast, punctual Österreichische Bundesbahnen (ÖBB) national railways system links even tiny ski townlets with major European centers. – Fly In/Ski the Same Day. Since flights from the U.S. generally arrive in Europe in the early morning, energetic enthusiasts can hit the slopes the same day they arrive — a speedy cure for jet lag. 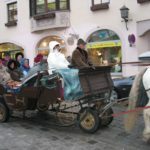 Best bets for fast access by train: Kitzbühel (2.5 hours from Munich) and Seefeld (1.5 hours from Munich). Since most villages lie at 2,500 feet to 4,500 feet, visitors acclimatize to the altitude quickly.